Spring is in the air and fresh asparagus is once again in the markets. Yes, it’s available year-round, but nothing beats freshly picked. Buy it from your local farmer’s market, if possible, as asparagus contains sugars that turn to starch once it leaves the ground. 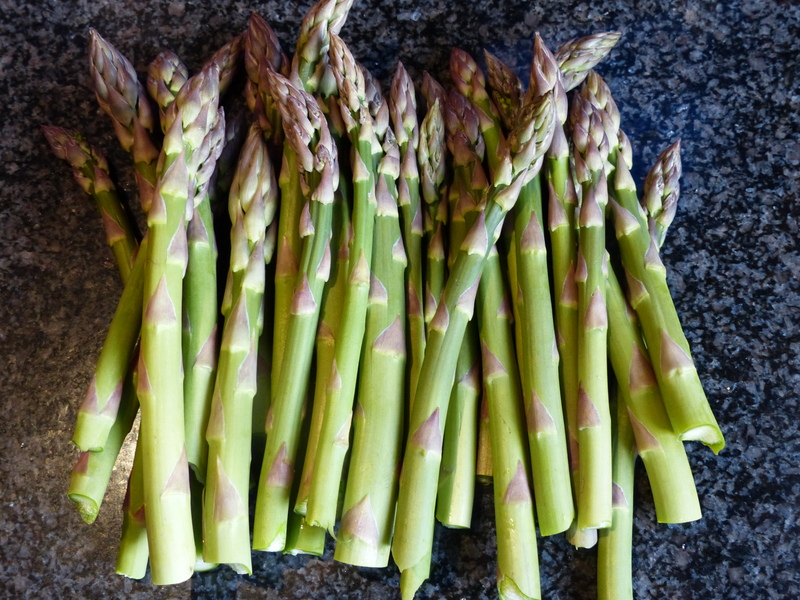 The sooner you eat it (and how could you allow a beautiful bunch of asparagus to sit around? ), the better. When selecting asparagus, look for bright green color and a tip that is tightly packed with a dark green or slightly purplish color. Thick or thin, it doesn’t matter. However do snap off any tough, woody ends: bend the spear and it should snap where the woody bit begins. Enough with Asparagus 101, on to the eating. Once spring hits I’m done with the heavy, baked comfort food of winter and ready for something crisp, crunchy and cold. This gorgeous salad ticks all those boxes. There’s the sweet taste of asparagus, shaved into thin strips, coated with a lively vinaigrette and tossed with roasted nuts for a bit of crunch as well as parmesan for a bit of saltiness and fresh mint, because who doesn’t like fresh mint? So step away from the oven and get spring started with this brilliant raw salad. Note: Thicker asparagus spears are easier to shave, so go for thicker asparagus as opposed to thinner, if you have the choice. If you don’t have sherry vinegar substitute 1 tablespoon sherry plus 1 tablespoon red wine vinegar. Also, if you enjoy the concept of the shaved asparagus salad, feel free to play around with different vinaigrettes. A roasted garlic vinaigrette would be nice or a classic French vinaigrette. Rinse asparagus then break off any tough, woody ends using the snap method. That is, hold the asparagus and bend at the end until it snaps off. The woody bit should snap off and you’re left with nice, tender asparagus. Shave asparagus using a vegetable peeler, rotating asparagus as you peel so all sides get peeled (otherwise you end up with a wider flat piece as opposed to skinnier pieces). Rub off as much of the dark outer peel of the hazelnuts that you can (if some won’t rub off, don’t worry). Using the blunt end of a meat cleaver, crush the hazelnuts. In a medium bowl combine the asparagus, hazelnuts and mint. In a small bowl whisk together the lemon juice, vinegar and honey. Slowly add the olive oil, whisking constantly, to form a vinaigrette. Pour over the asparagus and mix with salt and pepper to taste. Shave parmesan cheese on top (I use a vegetable peeler to make large curls).